Cassie contacted me well over a year before her wedding for planning assistance. We met many times to make her vision come to life. She wanted a Sunday brunch which I loved because it was out of the norm. It was a great idea! Her wish was to provide a setting for family and friends that included their children and was still formal but yet fun and relaxing. I think that we did just that! Cassie and Nick had been together for a long time and have 3 beautiful children together. It was so fun to get to know her as a person and as a mother. Watching her with her children was something that I as a planner will always cherish. She is such a patient and caring person. As a couple she and Nick are a perfect match. Their extended family was such a delight! Below are the images that were captured from their wedding day. I hope you enjoy them as much as I do! 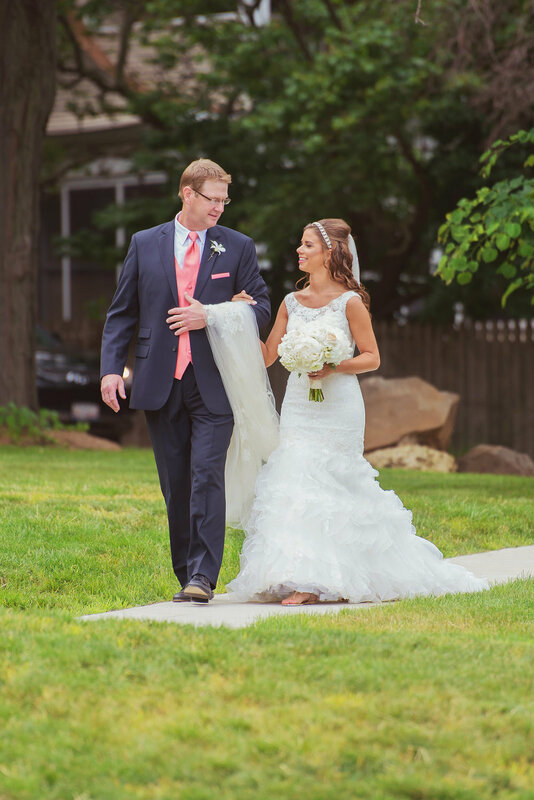 Melissa and Scott were a fabulous couple to work with! I am one lucky wedding planner! Melissa's mom contacted me and said that they were from the Chicago area but that her daughter was getting married in Rockford, Illinois and that they would need assistance from a wedding planner. Of course I said yes! 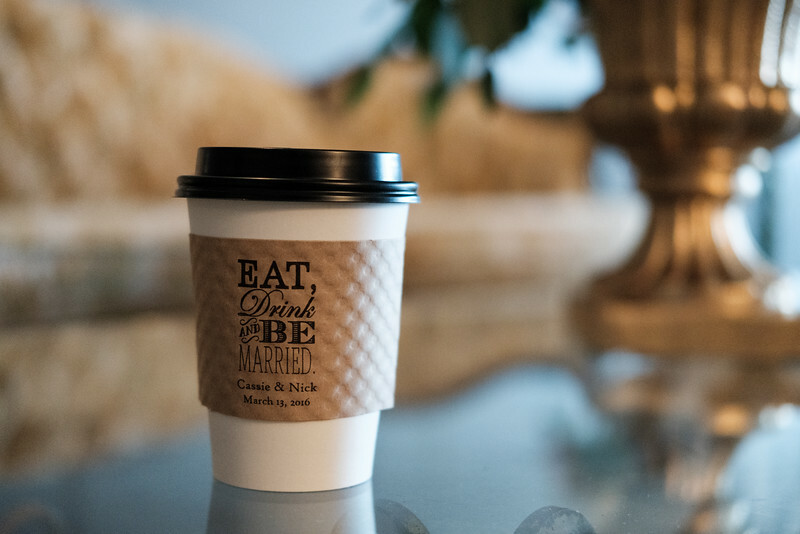 One of my favorite parts of my couples that I get the chance to work with is that when a part of their love story becomes a part of their wedding day, Melissa and Scott love to travel to different Brewing Companies and Rockford, Illinois was not an exception. 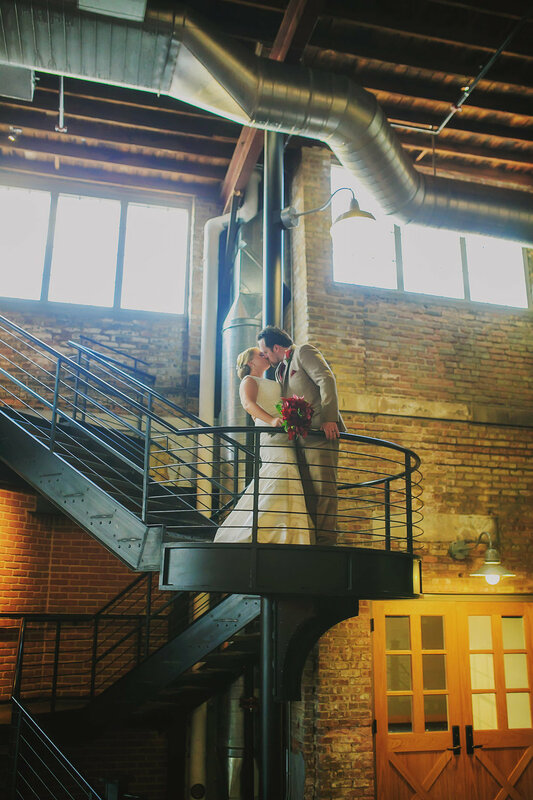 It was very fitting that their wedding venue be a Brewery and Prairie Street Brewhouse / Rockford Brewing Company fit that exact description. The pictures tell the story of their day and just how enjoyable it was. I hope you enjoy their story. Officiant: I "DO" Weddings Ltd. It is always a little nerve wracking ~ no lie, when another planner contacts me to assist with their daughter's wedding. With this wedding the assistance was my pleasure. Abbie contacted me to be their Month of Coordinator. I was ecstatic. Discussing all the possibilities and her vision of the day was so exciting. Abbie wanted a Fairytale wedding without too much pink with a Disney theme. 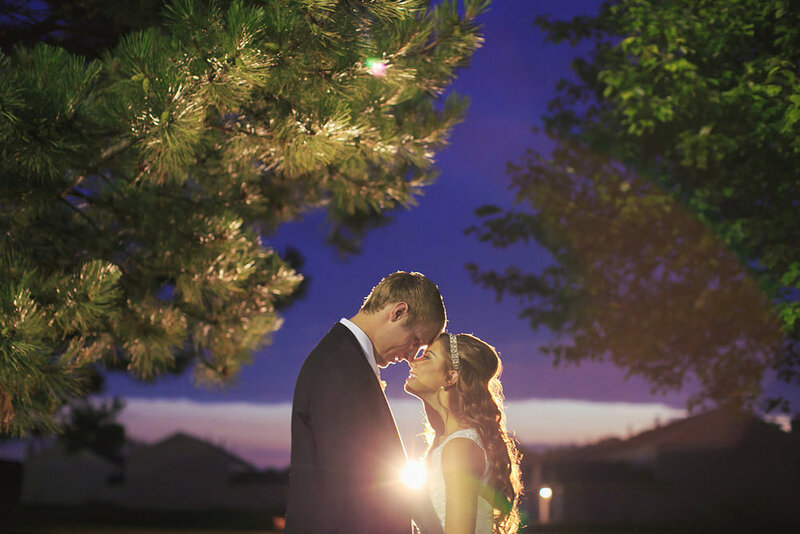 The pictures below prove that a Disney Themed Wedding can definitely be done with class. There were several princess tables that showcased Disney Princess movies without any type of animation and everyone received a Golden Disney Book with a CD of photos of the couple inside each book as a favor. 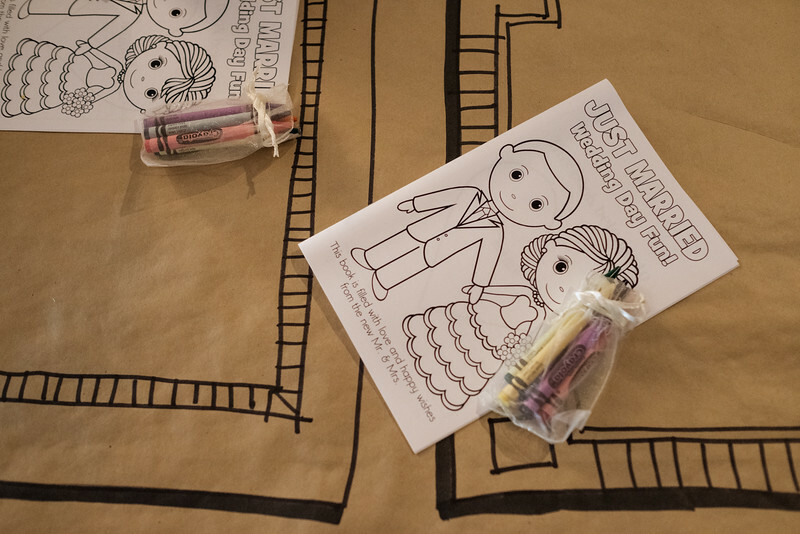 This wedding had it all including a comedian/magician and a caricature artist. Let me begin this by saying that I have these big dreams and goals that sometime consume my thoughts and this was no exception. Thinking of all the items that I wanted to accomplish within my career this was the next item on my list. Get an A list wedding expert to come to the Rockford Area. And.... who doesn't love the TV show Say Yes to the Dress? So naturally it was Randy Fenoli. I knew that I had my work cut out for me and met with Giovanni's to discuss the opportunity with them. They were graciously willing to partner and so preparations for An Evening with Randy Fenoli began. We met with several companies that were sponsors for the evening. Those included: DC Estate Winery, SVL Productions, Death's Door Spirits and Vera's House of Bridals. We enlisted a group of vendors for their support and as you will see by the photos provided below they did not disappoint. Every individual business we talked with was willing to participate in this evening. They are listed at the bottom. Michelle Marcomb with B103 and Whitney Martin with WIFR served as our emcees for the night. Randy gave a fabulous motivational speech with centered on his 3 E's ~ "Empower, Educate and Elevate". He had the room immersed in laughter for most of his time with us and we enjoyed his gracious hospitality of meeting each guest that attended that evening. I can say that in my short time with Randy he is one of the most genuine individuals I have met in my career. His knowledge of the wedding industry is beneficial to all and his message is that you are beautiful inside and out no matter who you are. Let's just say that after this, I have some more ideas definitely in the works! 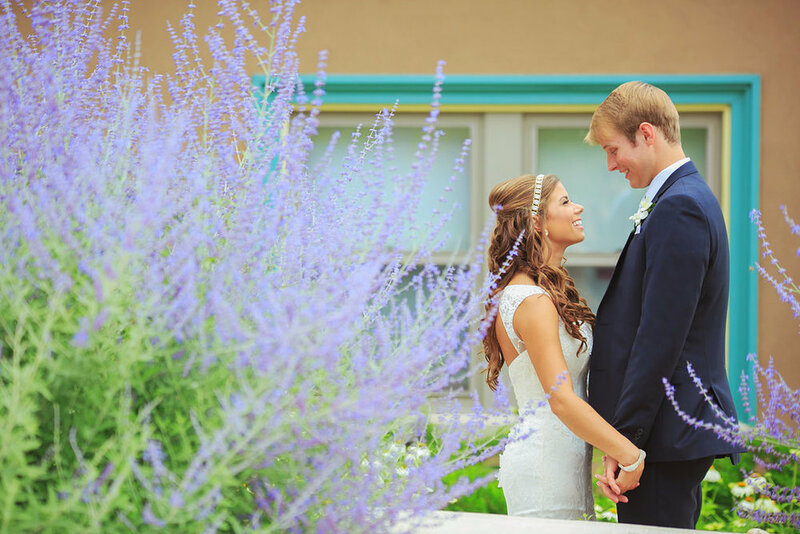 Over a year ago - I was contacted by Alix to help her and Collin plan their wedding. What a delightful couple! The whole point of them hiring a planner was that they wanted to enjoy their wedding day. As most of you know the motto of Accent on Events is to "sit back and be a guest at your own wedding." They were able to just do that! We came in behind the scenes and worked with the couple to plan the day to their specifications. We enjoyed working with them and their families. Everyone was so accommodating and warm. 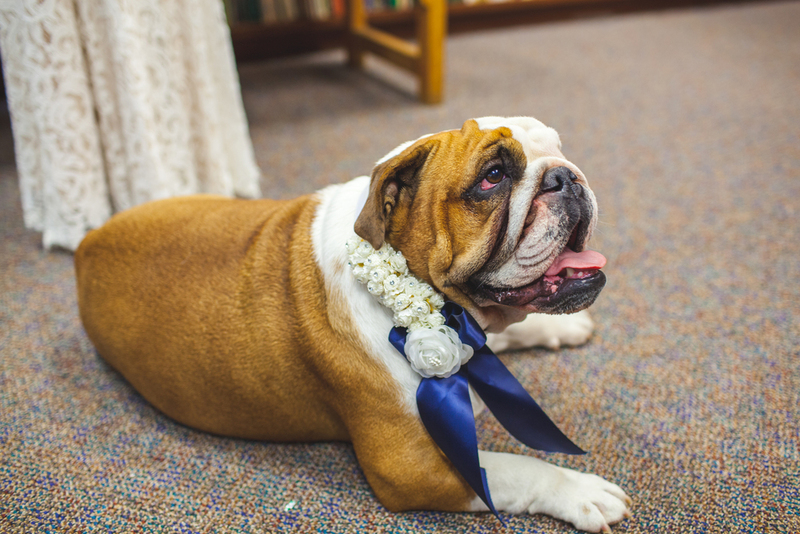 They were married by a family friend and their dogs even stole the show! They enjoyed the party at Klehm and all guests parted on a bus back to the family property to enjoy a bon fire well into the night! Please view the photos below of their wedding in the garden. 1. 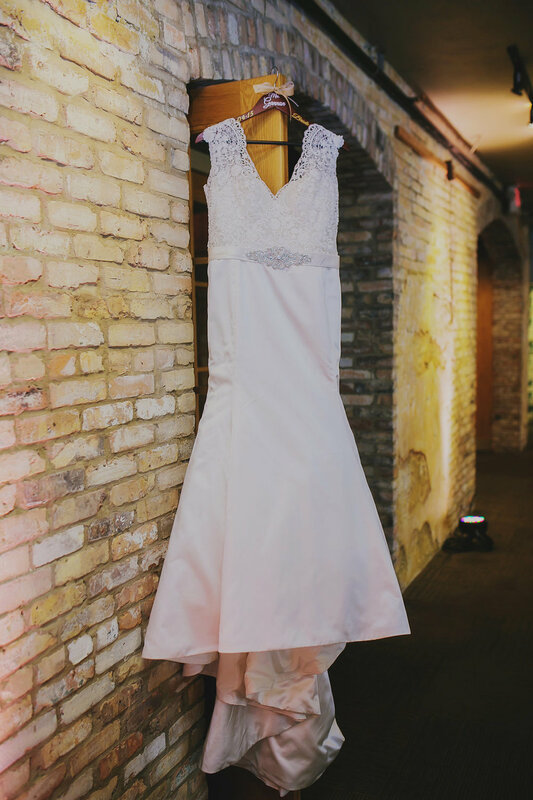 Save room in your bridal gown budget for alterations | Alterations to bridal gowns generally cost extra money, and nearly all gowns will require some level of alteration. I recommend estimating alterations to cost between $300 and $600. This is, of course, an estimate which changed based on the design of the dress and the amount of alteration being performed. So, keeping this in mind when picking a dress can help you stay in your budget! 2. 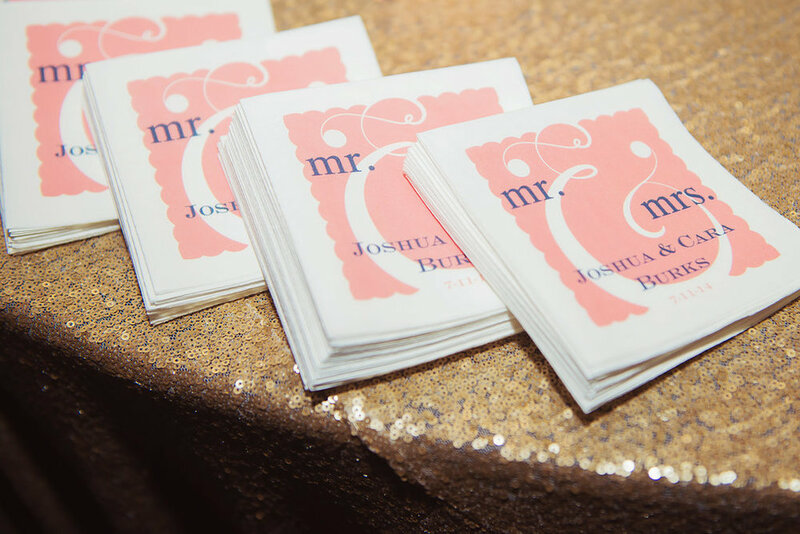 Limit the bar options | While many people frown upon cash bars, they are actually becoming more and more common in the wedding industry. Picking several wine and beer options for your guests is a very easy way to be respectful of your budget because wedding guests generally consume less alcohol with a limited bar, thus putting valuable pennies back in your pocket. 3. 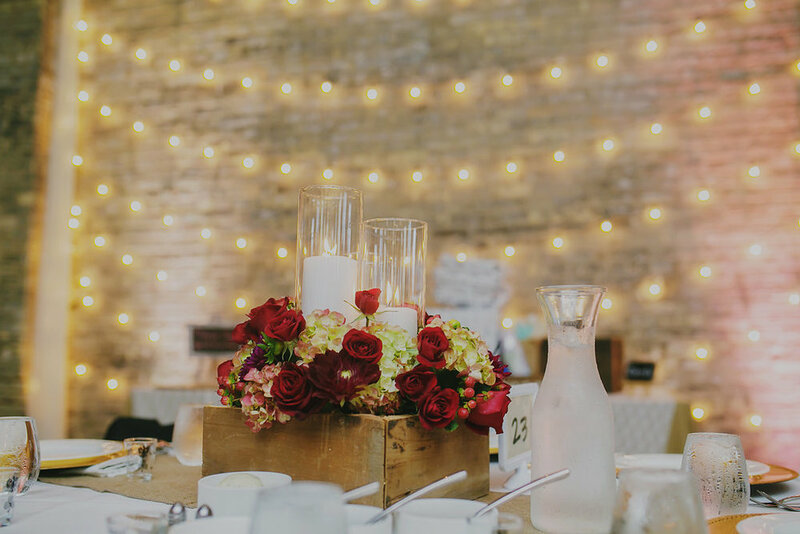 Reconsider your centerpieces | Wedding day flowers can often become pricey. Luckily, there are many different options when it comes to centerpieces. Whether you opt for candle displays or simply decorate the table with a single flower, your tables will still look elegant while reducing your decorating costs. 4. Rent, rent, rent! 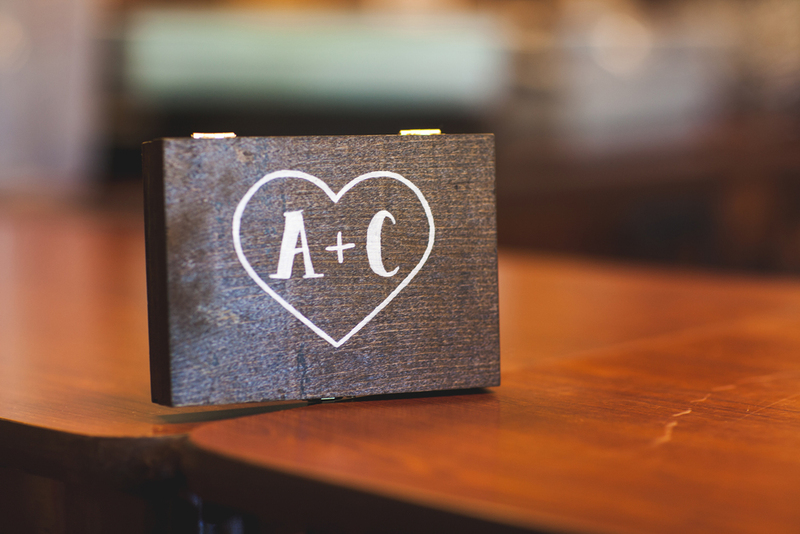 | While DIY work can be a fun part of the wedding process for members of the wedding party, there are many items (i.e. vases, candle votives, lighting, chargers, etc.) that can be rented. Rentals allow you to enjoy your wedding day without being stuck with items you’ll never use again when the day is done, and they are usually cheaper than buying the items brand new. 5. Serve less food | Providing heavier hors d’oeuvre options during cocktail hour can give you license to serve less courses during your reception dinner, thus saving you money on your catering bill. Your guests can snack on filling foods during cocktail hour, allowing for more time to dance and celebrate (BONUS: more spending money for your honeymoon). Bar options are one of the most confusing things to be agreed upon in a contract. 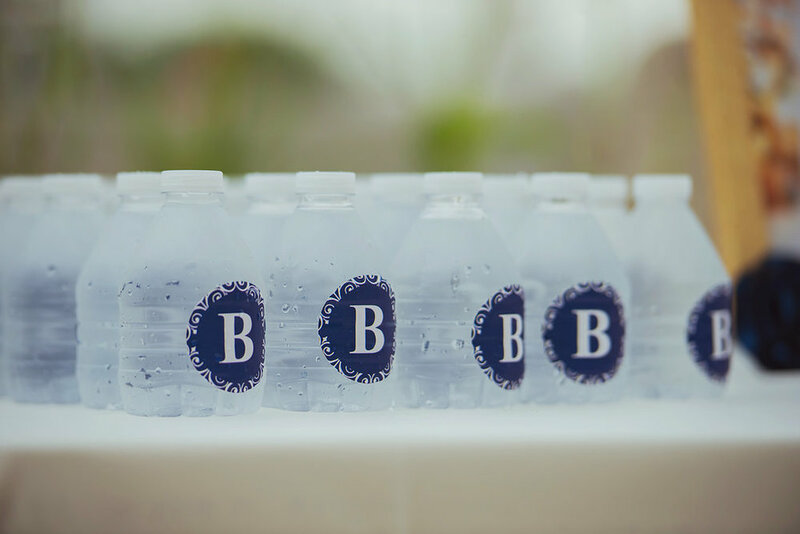 Catering companies offer many different options for your wedding day, and sometimes it can be difficult to distinguish which option is best for you.Open Bar | With this option, the bar is stocked with everything needed to provide a night of fun and [lack of] memories. The bartenders keep a running tally of all drinks bought throughout the night, and an invoice is sent following the wedding reception. Bar Tab | This option is very similar to the open bar, except that the bar invoice is paid in advance. The bartenders keep a running tally of all drinks bought and after the amount reaches the previously paid amount, the bar becomes a cash bar. Cash Bar | Nothing is included with this option. Everyone pays for every drink, excluding soda and water. Wedding day fashion isn’t just for the ladies anymore. Male members of the bridal party can now ditch the simple, monochromatic vest and tie combination in favor of a more exciting, out-of-the-box ensemble. Here are three menswear trends that you need to see: Subtle Patterns | Patterned vest and tie combinations are a great way to mix your attire up without committing to anything too extreme. Patterned menswear draws the eye to the handsome groomsmen, without taking attention away from the bride. Bold Prints | This trend is for those men who aren’t afraid to make a statement. 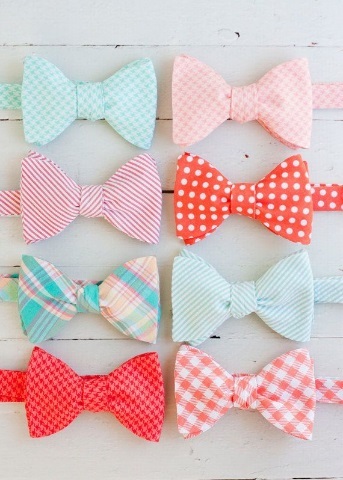 Bold prints in colors that complement the wedding décor will really stand out in wedding photos! Printed Shirts | This is another great way to subtly accessorize a wedding day tuxedo. A printed shirt is fashionably adventurous without being too loud. Paired with a plain vest and tie combo, this look is perfectly demure. Hello and welcome back to Innovative Inspiration. This is the last installment of my blog series, exploring various mediums which can be used for wedding day inspiration. 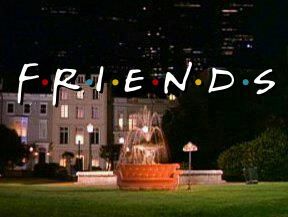 The final week of this series will be dedicated to the long-running television series Friends. The series began in 1994 and became one of the longest running television shows, lasting until 2004. The series’ characters quickly captures the hearts of millions because of their ability to relate to a variety of viewers and their endless quirks. Enjoy the last post and check out the Pinterest board! Venue | With Friends being set in New York, I think it would be perfect to set the wedding in a big city. The venue should have a view of a skyline, as a nod to the series’ beginning theme. This setting would be conducive to almost any type of wedding imaginable. I imagine this to be a winter wedding, as a nod to Phoebe and Mike’s wedding, in a place of great meaning to the couple. But, that’s not to say that this could not also be a spring, summer or autumn wedding. I also imagine this wedding ceremony to be adorned with Italian lights and minimal—yet bold—flowers. Floral | Throughout Friends, a simple and unstructured vibe is exuded. For this reason, I believe that a simple floral scheme is best. I chose one type of flower to represent each main character in the series, and—just as in the television series—when put together, they make a wonderful arrangement. Chandler can be compared to silver brunia. This unique plant is characterized by spherical growths and is often not considered for arrangements due to its misunderstood nature. Similarly, throughout the television series, Chandler is misunderstood or overlooked because of his unconventional sense of humor. Joey is very hard to describe. So, the flower that he is synonymous with is the flame lily. This gorgeous flower is hard to describe, yet still very beautiful. And, since Joey can make bras undo themselves by uttering those three small words (“How you doing?”), I believe that this flower described him perfectly. Monica’s floral counterpart is the geranium. So as the geranium has many small blooms per flower, Monica has many different facets to her personality. Time and time again, she shows that her caregiving, comedienne, hyper-organized and motherly traits truly bring the group together to make one unit, just as the geranium’s many blooms make up the whole flower. Phoebe is represented by the Gerbera daisy. A pop of brightness in a monotonous world can describe both the Gerbera daisy and Phoebe Buffay Hannigan. Rachel is represented by the red rose. Just as the red rose is classic and elegant, so is Rachel. Yet, both also prove their flexibility and versatility time and again. Ross is a relatively simple guy. He is also fiercely loyal and always sticks by his friends. Just as a flower would not be able to survive without its leaves, neither would our favorite group of friends. So, Ross is represented by the olive branch. Though understated, the olive branch adds an element of greenery to the flowers which is not only beautiful, but also necessary. Table Settings | To complement the eclectic floral scheme, I think it would be fitting to use multiple sets of chinaware to set the tables with, making sure to mix the pieces up among the tables. I would also rent a variety of chair styles and colors. If set in this way, the eclecticism of the tables would perfectly pay homage to the dining room table in the iconic apartment that each character of Friends once occupied. To get a visual picture of what I have described above, check out the Pinterest board I have created to complement this blog. And, if you haven’t yet, be sure to check out my three previous posts in this series. I hope you’ve enjoyed this series as much as I have. Stay tuned for future inspiration! Welcome back to the Innovative Inspiration. 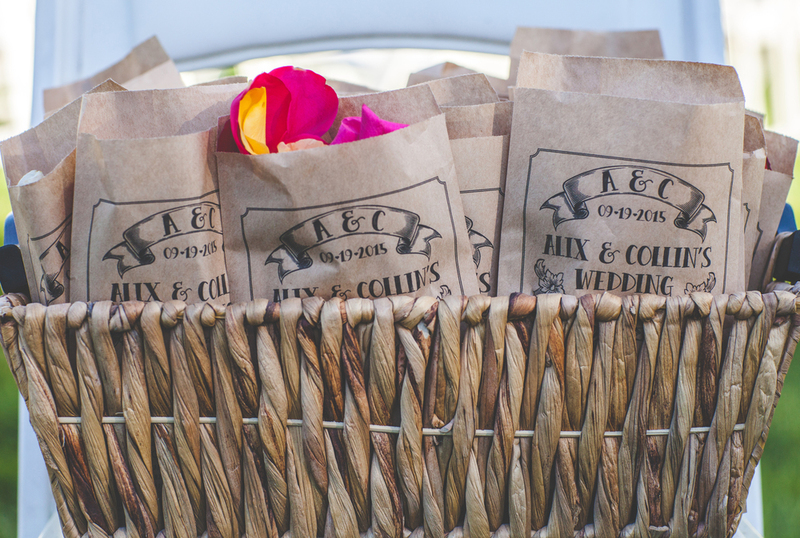 In this blog series, we explore unconventional media which can be used to inspire your wedding. In week 1, we saw Viktor & Rolf’s “Flowerbomb” fragrance inspire a beautiful wedding. Meanwhile, last week, we saw a wedding inspired by the Pixar hit Finding Nemo. For this week’s inspiration, I have chosen a piece of art by Gustav Klimt called “The Kiss.” This work of art very appropriately pictures a male giving his female lover a kiss on the cheek. Shown in gold, these lovers are enjoying a date in a field of flowers. Be sure to check out the Pinterest board and enjoy! Venue | Because this painting encompasses a very rich color palette, I picture this to be an autumn wedding. So, I would imagine this wedding’s ceremony to be held in a long-standing church with stained glass windows. The reception would be held at a country club in a room with a view of the color-changing landscape. The ceremony space for this wedding needs little modifying; it will be complete with a simple aisle arrangement, placed at the edge of each pew to bring in not only the autumn colors, but also the easily usable autumn-esque items such as pumpkins and other gourds, cinnamon sticks and multi-colored leaves. The reception space for this wedding, unlike the ceremony space, has more room for extravagance. An open country club space calls for plentiful autumn decorations and rich golds and greens from the painting. I picture the space to be dripping with gold, cinnamon and roses to pay homage to Klimt’s piece. Floral | Although this painting is simple, with a minimalist color palette, that doesn’t mean that the floral arrangements will suffer. One of the first things to consider when putting together a wedding’s floral scheme is the season, which in this case is autumn. So, for this wedding, I would use red roses, baby’s breath, chinaberry, red alstroemeria and rowan berry. This warmly colored floral scheme will pair perfectly with autumn items such as pumpkins, gourds, cinnamon sticks and multi-colored leaves, as mentioned above. So, for the actual arranging of these flowers I would choose tall centerpieces in gilded gold vases. In these arrangements, I would place cinnamon sticks among the flowers and scatter miniature pumpkins and various other gourds around the table. This arrangement would perfectly complement the table settings, as discussed in the next section. Table Settings | Thus far, the planning choices of this wedding favor a complex tablescape; with rich colors such as gold and cranberry, this wedding’s warm and inviting colors will give birth to some of the most pleasant and fond feelings and memories for your guests. I would use gold table cloths with a cranberry-colored tulle overlay to foster a warm, autumn environment. Atop this linen scheme, I would set a beautiful table-setting complete with crystal drinkware and utensils. I would use gold opera chairs and weave cranberry-colored tulle through the slats in the backs of these chairs. As I can’t discuss every piece of inspiration in depth, I have created a Pinterest board, as mentioned earlier, with both ideas discussed in this blog and new ideas. I hope you have enjoyed this post and seen some new ideas. And keep in mind, this is just one idea way to inspire your wedding day! Stay tuned for more! Hi! 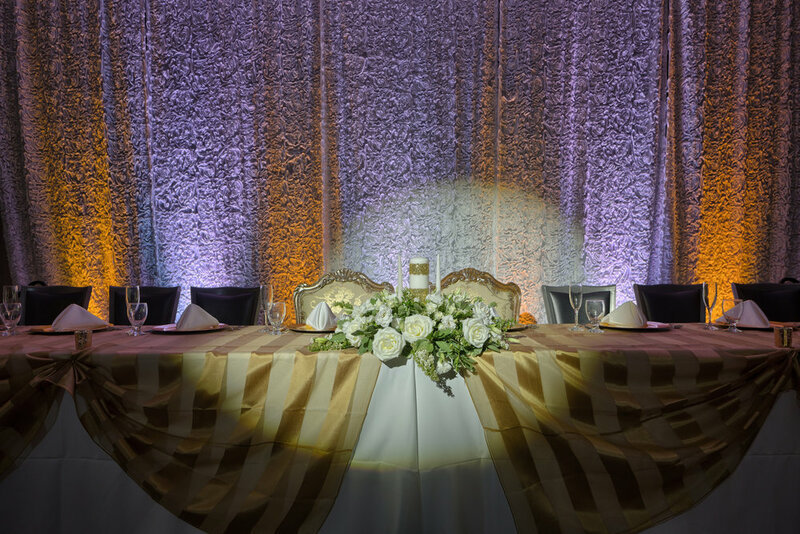 Welcome to the second installment of Innovative Inspiration, a blog series that explores various mediums which can be used as wedding inspiration. This week’s installment is based on the movie Finding Nemo. When it was released in 2003, this Pixar movie quickly won the hearts of adults and kids alike. The movie includes a color palette as bright and cheery as its characters, including shades from cobalt blue to electric yellow and all colors in between. Please enjoy the post, check out the Pinterest board (https://www.pinterest.com/Accentonevents/innovative-inspiration-finding-nemo/) and be sure to check out the first blog in the series if you haven’t already done so. Venue | With this wedding, the perfect venue is very important. Given that this is such a bold color palette, I would tend to lean towards (1) an outdoor ceremony and reception overlooking a lake or (2) an empty warehouse space. An outdoor ceremony and reception overlooking a lake is still, and may always be, the go-to option for peak wedding season. With this option, our Finding Nemo inspired wedding automatically inherits more colors and objects to use as inspiration. For example: incorporating trees into décor or finding a new color to include in the wedding’s palette (i.e. a native flower or the bark of the trees). Yet, an indoor warehouse space provides more of a “blank slate” to create within. With an empty warehouse, I believe that the colors would come alive in the room and really pop. And when gorgeous uplighting in hues of orange, pink and subtle blues is factored into the equation, I can only picture the space as a scene from a movie—which suits our inspiration. Floral | Since Finding Nemo includes so many colors, this realm of wedding planning is bound to be fantastic. The first question I was struck with when picturing this wedding was how to properly convey the personality of the movie without being—for lack of a better word—cheesy. Well, in my opinion, a wedding’s floral scheme is the area with the most permission to be loud and showy. So, the scheme that I envision for this wedding includes primarily pinks, blues and oranges with minimal “buffer” colors. I chose pink spider mums as a nod to Nemo and Marlin’s home—a sea anemone. To complement the pink spider mums, I believe that orange roses are best, as the classic silhouette allows the spider mums’ shape to shine through despite being surrounded by other bold colors. In my mind, blue delphiniums are a MUST for this theme because of their unique shape and rare color. But, the best thing is that since there are so many other colors in the movie, such as purples and greens, the floral arrangements will tend to vary in colors, flower types and size of arrangement, so there is plenty of wiggle room! 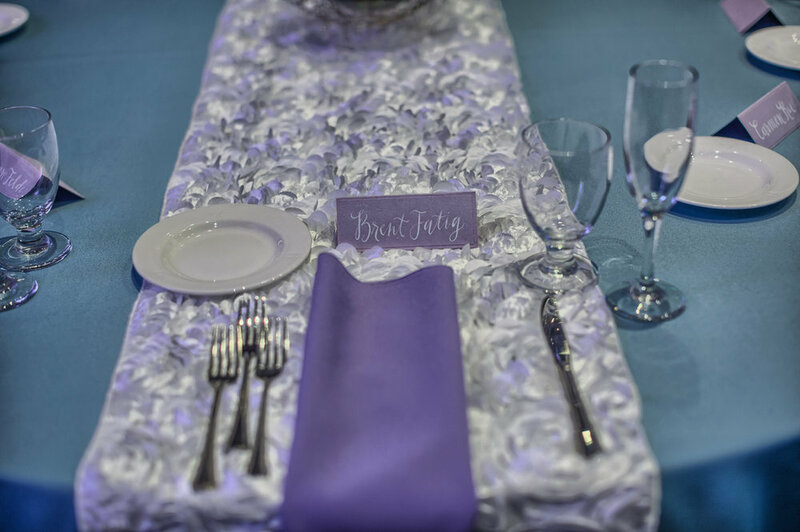 Table Settings | For both venue choices, I favor a simplistic table setting; clear chargers, a simple napkin fold and ghost chairs are best. And trust me, you’ll want your vivid colors and to be the star of the show! For table cloths, there are two options speaking louder in my mind than any other. The first being a cobalt blue cloth with an orange tulle/ lace overlay, and the second being a cobalt blue table cloth with a fuchsia textures overlay (see Pinterest for reference photo); cocktail tables should follow this same scheme and be cinched with crystal embellishments. 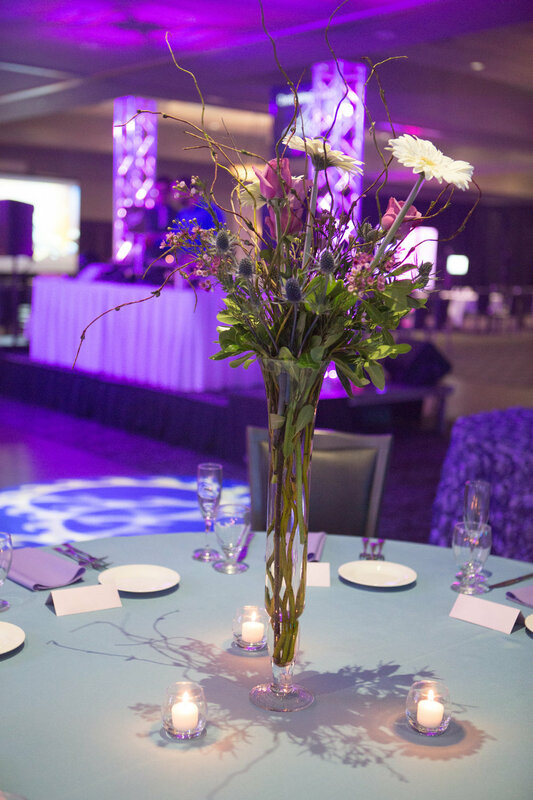 Lastly, as previously mentioned, there is a lot of creative freedom to be had with the floral arranging for this wedding, so I would recommend going with a mix of tall, mid-sized and short centerpieces. As I can’t discuss every piece of inspiration in depth, I have pinned many reference photos and extra inspiration to the Pinterest board mentioned earlier. Keep in mind, this is just one idea wedding inspirations, stay tuned for more! There are plenty of things that can be beautiful inspiration for your wedding, thus I have decided to begin a series of blog posts to exemplify that. For the first instalment of “Innovative Inspiration,” I have decided to use the Viktor Rolf Flowerbomb scent. A delicate pink hue and wrapped in an architectural bottle with a silver nameplate and black flower accent, this perfume is a fragrant and floral hyper-feminine scent. Enjoy the post and check out the Pinterest board at www.Pinterest.com/Accentonevents. Venue | In my mind, there are two venue options for this wedding: (1) based on the fragrance’s name, a gorgeous outdoor scene, which could easily paint the picture of effortless romance through nature’s beauty and calculated planning (2) inspired by the angularity of the perfume’s bottle, a trendy, geometric indoor location adorned with black modern furniture and dripping with pink flowers would perfectly embody the essence of Flowerbomb without being cliché. 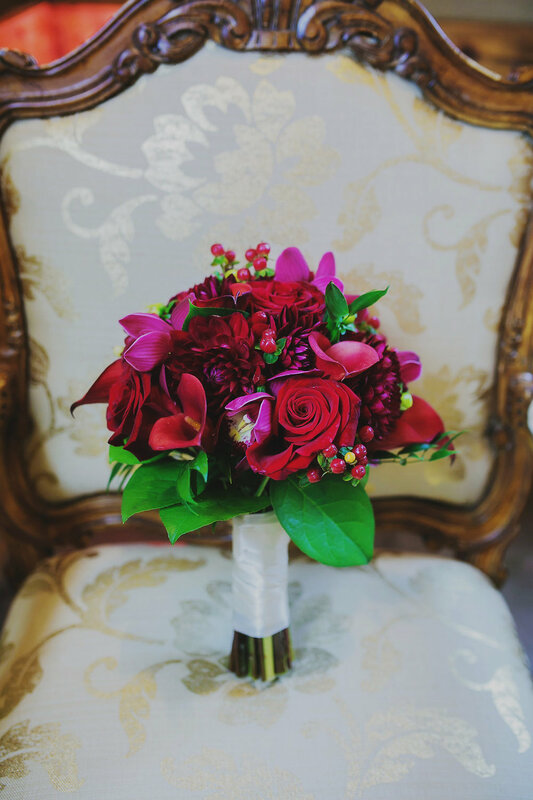 Floral | With a name like Flowerbomb, this realm of wedding planning is understandably important. As with all weddings, the floral selection is dependent on the date of the wedding. So, for the purposes of this blog, we’ll say that this is a spring wedding. The floral scheme that I envision for this wedding includes pinks, whites and blacks and because of Flowerbomb’s name, I’d like to include as many different seasonal flowers as possible in eclectic arrangement. The first flowers that pop into my head are anemones and sweet peas, but I also see a place for other flowers such as cherry blossoms, cosmos, dahlias and poppies. Though the pinks and whites are easy to account for, the black color is more difficult, but it is found in the anemone flower and can be easily incorporated through vases and wrappings—such as in the bridal bouquets! Table Settings | In my mind, there are two options for table settings, dependent on the venue. For an outdoor venue, I think that simple ivory linens and tableware would allow the flowers to be the focal point of the décor. Equipped with pink napkins, silver chairs and tall centerpieces, this scene would blow your guests away! For an indoor reception, I would go linen-less with black furniture. This would perfectly make a modern and chic statement for your wedding, while the black furnishings would allow for something bold to be done with the head table- up to you! With the exception of short centerpieces, I wouldn’t change a thing from the outdoor table settings- simple elegance is key when using Flowerbomb as wedding inspiration. First comes love, then comes marriage, then comes the baby in the baby carriage. As with many childhood plans, this verse from the familiar, childhood game often shows itself to be untrue. As the cultural tolerance for young parents and for single parents (whatever the circumstance) increases, the American schema for the nuclear family—naturally—evolves to include many different images of a healthy family. And the best news is, that each and every image of these families is healthy and beautiful. So, with this ever evolving image of the nuclear family, new terms such as “blended family” are adopted. A blended family can be simply thought of as a family made up of a couple and their children from all previous relationships. Currently, the average age of a woman having her first child is close to 25 years old, while the average age of a woman at first marriage is 27. So, these age differences bring me to the topic of this blog: blended marriages. But, what is a blended marriage? A blended marriage is not just the joining together of two people, but rather the joining together of two families. I believe that it is important for blended marriage ceremonies to occur if a blended family will be present after the marriage has been performed, especially so for children effected by the marriage. Including children in the marriage ceremony will demonstrate familial commitment both to the world and, more importantly, to the children themselves, thus creating a deeper trust for the kids. Because of this, a new dimension to the family’s relationship can begin to evolve. 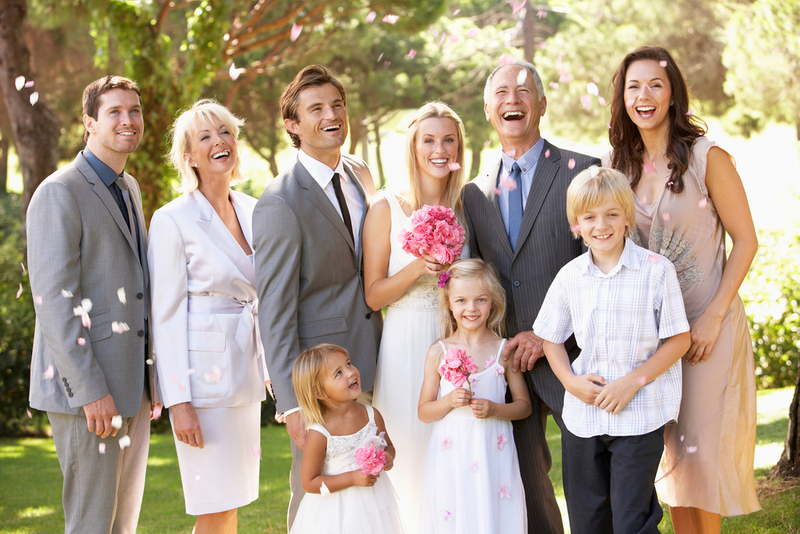 There are many ways for a couple to modify a traditional marriage ceremony to include their children. Many of these ways can be easily thought of—we’d love to help you!—or found on your favorite virtual pin-board. These ideas range from as simple as a recognition during the ceremony to as involved as custom designed jewelry pieces for the entire family. However, in the end, it does not matter whether the kids are given spots in the wedding party, simply recognized during the ceremony or given personalized gifts. It is important to remember that no amount of recognition or gifts will have any significance for the children if they do not understand that they have a special and unique importance to the marriage. Not in the day-long-frills-and-lace-party-all-night sense, but in the lifelong-institution-for-better-or-for-worse sense of the word. It is only after this happens, that bigger things can happen! Hi there! My name is Emily Palmer and I am currently in the second semester of my senior year at the University of Illinois Urbana-Champaign. I am majoring in Recreation, Sport and Tourism with a focus on Tourism and Event Planning. I am beyond excited to be joining the Accent On Events team for the next few months as an intern. So, here is my first blog. I hope you like it! A couple’s wedding day is their chance to celebrate their personal love story with the people most important to them. And, with the recent snowfall I thought it the perfect time to blog about wintertime weddings! Of course summer weddings are insanely popular, but I am here to tell you that winter weddings are equally as beautiful. While some couples know their date months—and sometimes even years—in advance, others do not. And that’s perfectly OK because every couple is different and unique. And while some couples are able to wait for a special date, sometimes love just can’t wait for the summer! Or, perhaps the season that many of us dread, winter, has a special significance to a couple. But, what about the cold? It is of course winter, so cold weather is—for the most part—inevitable. However, instead of trying to beat the cold, I recommend embracing it! This is the perfect opportunity for guests to be able to mingle with each other and catch up with old friends in a warm, cozy, indoor environment. There are also other perks to winter weddings, one of which being the freedom to serve hot beverages. Think about it: hot chocolate, eggnog and coffee are beloved winter beverages and are easily made adult by adding yummy liqueurs such as Bailey’s Irish Crème, Kahlua, amaretto or even Grand Marnier. But, not all beverages have to be hot to embrace the winter theme…I’m talking about peppermint. This holiday staple is a universal hit—it’s perfectly mixable in both kid-friendly and adult drinks. And hey, it would be pretty silly to serve peppermint flavored drinks at a summer wedding, right? But, what about the snow? Well, winter weddings provide gorgeous natural décor and multiple gateways to bring a wedding to life. The key to a successful winter wedding is identifying these things and using them to your advantage! There are many creative ways to embrace a winter theme across many traditional aspects of a wedding. Photos can be directed and styled to reflect the weather. Cakes, cupcakes or even cake pops can be beautifully embellished with snowflakes. Lighting displays can be assembled to create a reception environment reminiscent of the holidays or winter landscapes. And table settings can be customized to reflect winter in whatever way a couple desires. But, it is important to remember that at the end of the day, a couple’s wedding should reflect who they are as people and pay homage to their personal love story. A certain season coupled with wedding norms should not dissuade a couple from tying the knot during a particular time of the year because every wedding is beautiful and unique, just like each and every couple. We are pleased to bring you Cara's and Josh's love story. 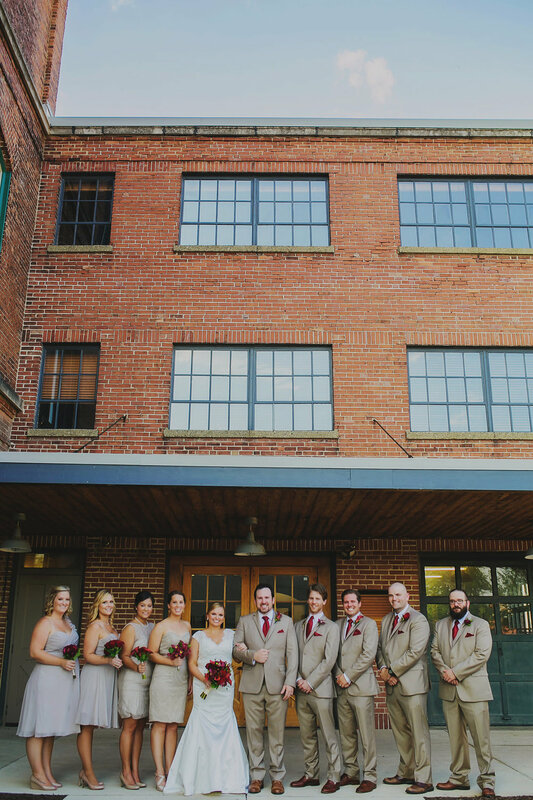 We were so happy to be a part of their wedding!! Cara Burks still laughs about the awkward first impression she had of her husband Josh. It was 2006, and Cara, then a ninth grader, had just finished playing in a basketball tournament at the small Christian school they both attended. It may have been an odd pickup line, but it caught Cara’s attention, and began a natural friendship. “It seems as though we’ve been best friends forever,” she says. The two dated throughout high school, taking a brief break when Cara, who’s a year older, left for Maranatha Baptist University, in Wisconsin. After Josh went to West Coast Baptist College, in California, they picked up where they had left off. 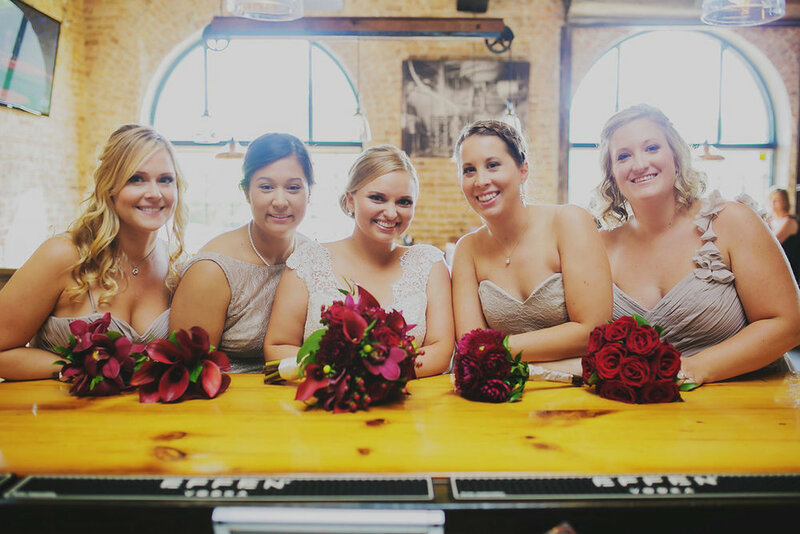 Cara graduated in 2013 and moved home for a job with a local wedding planner. Josh was still in California, or so Cara thought on an evening in late November 2013, when her twin sister, Hallie, and brother-in-law, Justin, invited her out to dinner. While they were gone, someone began playing Cara’s favorite song on the dining room piano. “I feel this tap on my shoulder, I turn around, and it’s Josh, with a ring,” she says. Planning in just nine months was sometimes trying, says Cara, but she had a helping hand through every step. 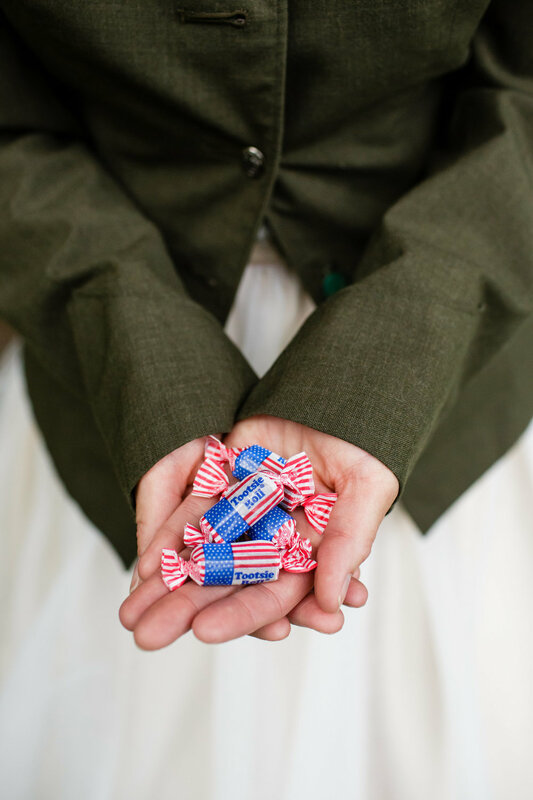 We had so much fun collaborating with Bride Meets Wedding for this Patriotic 1940's Backyard Americana Wedding. We decided on a 1940's theme that incorporates a modern day twist. 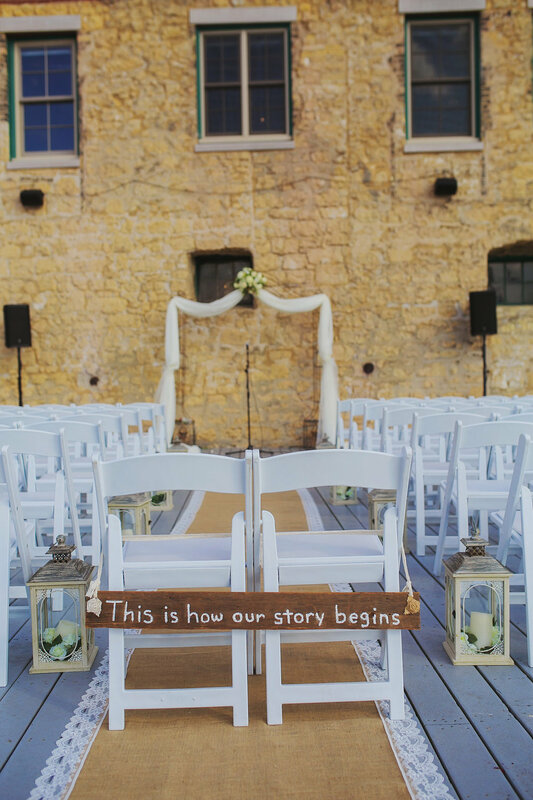 We hope that this brings you some inspiration in your wedding planning process. Bridal Gown: Sara Grace Co. Bridal Hairpiece: Sara Grace Co.
Several months ago we were asked to participate in Giovanni's Open House in Rockford, Illinois. 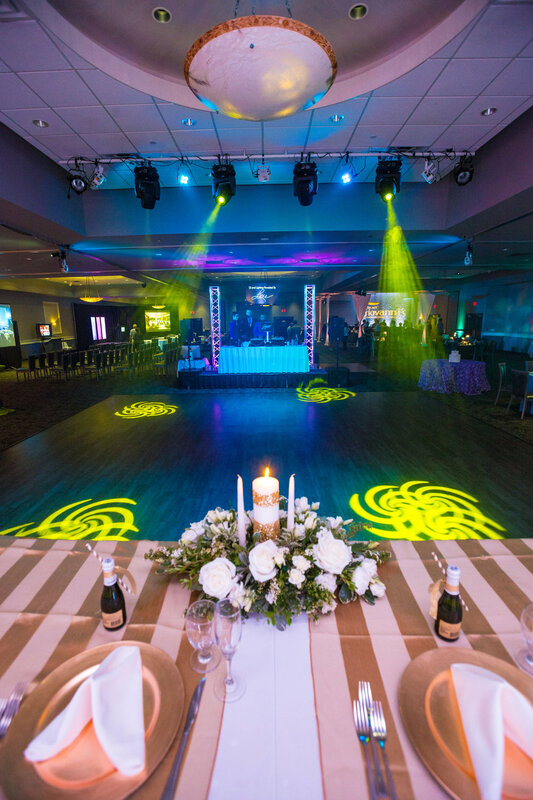 They wanted to showcase their newly remodeled ballroom in all the different aspects of events. Accent on Events focused on a budget friendly wedding reception, a head table and an Exquisite Wedding Reception. Below are photographs from the event. It was fun for us to showcase ourselves while working with a group of professional vendors to come up with a design for all areas that would be an option for couples to utilize.